In Pittsburgh, in 2015, I went on a tour of houses that had been turned into works of art by asylum seekers. Artists painted on the walls, writers wrote words on the doors, and musicians greeted visitors with their songs. But what fascinated me the most was the garden, not only because the residents had planted their favorite varieties, but people passing by had written down their dreams on pieces of paper that were clipped to the fence. The following day, I thought of those dreams that hung like laundry on the line as I contemplated the photos of the “She Who Tells a Story” exhibition, which included works by women from Iran and the Arab world. 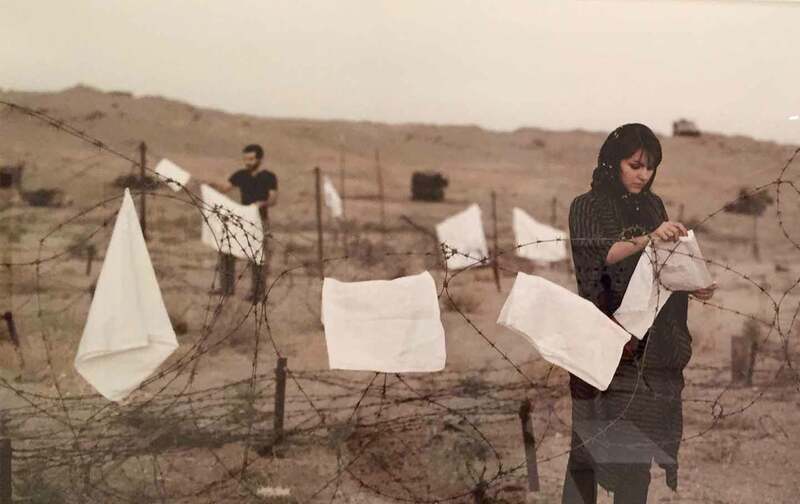 Today’s Life and War was a photo of an Iranian couple hanging their laundry on barbed wire — their pieces of clothing looked like white flags in a time of war, or like delayed dreams. For eight years, we were busy killing them, and they were busy killing us. That was enough time for the dreams, theirs and ours, to dry on the ropes. Another picture I paused in front of was Aerial I, from Shadow Sites II. It reminded me of the 1991 Gulf War, when the satellites took pictures of us from above, and we appeared merely as dots moving in various directions — you couldn’t see the fear that was the cause of our random movement. Being unable to go to the bathroom, for example, because we were walking in the open air — like everyone else who’d escaped the war — was not something shown in the images taken from above. The satellite images depicted us as rows of ants leaving their hills, leaving behind everything they had worked at for their entire lives. Every passage was an exodus for them. Our houses looked like dark holes, sometimes lit by the explosions. My home was in that little spot right there. Can you see it? From above, it isn’t possible to see inside the houses, to recognize the lives of the inhabitants, their struggles over the little things and the big things, their movements getting slower and slower all the time. From above, the burnt fields and bewildered animals look more like an abstraction. From above, there are no souls, only bodies, but they are seen as hollow forms, moving the way atoms do in the universe — unseen. From above, it’s possible for bodies to disappear, to assimilate into water or earth or fire or air. The signs on the paths reflect the loss of souls or bodies or both. From above, bodies intersect in lines and squares and circles — they look like scars on the face of the earth. From above, forms are shadows of reality, like those in Plato’s Cave. To see those intersecting dots and lines is to find myself back in Baghdad: Here, we are moving out of our house. My mother seems concerned about the heavy stuff we can’t carry with us — the Persian carpet, the piano, the antique sewing machine. In action movies, fires are started, walls crumble down all at once, planets shake, birds fly off the trees. But we weren’t in a movie when we saw all that happen. This was our reality. I could never understand how the birds remembered their old songs! The boy next door — who used to play in the street with my brothers, who greeted me with a wave but never said a word to me — left wearing khaki and boots, lifting his helmet slightly in a simple greeting, saying nothing. He is the one whose name was written in white letters on that black banner in front of their house, so his mother could be called the mother of the martyr instead of the mother of Tawfiq. I was in a ship on the Tigris when I wrote my first poem. I gave it to my cousin and he made it into a paper boat. He tossed it into the river and we watched the boat-poem drift away down the river. One day, in the kitchen, my period came. I told my mother and she said, “All girls bleed!” Really? I wondered. It’s scary that we have to bleed every month. I thanked God for being born a girl. Who knows how much the boys were going to bleed over there — they could probably bleed anytime, any day of the month, unexpectedly, maybe without any treatment. A siren went off and the lights went out. We were instructed to turn off the lights every time we heard the siren. That’s why I came to believe that the war was a button to turn off the lights. Someone drew a circle in the air, but half of it disappeared. Each of us tried to complete the circle. We called it the moon, but it wasn’t. We called it the globe, but it wasn’t… Each of us brought a word to call the circle. Our words are half the story. Nobody knows the whole story. Only a few friends knew I was leaving the country. “Where do you want to go? America?” one of them said. “But don’t forget, poetry only exists in the margins over there.” For that friend, nothing could be worse than marginalizing poetry! When you live for words, they may actually end up costing you your life. I wasn’t sure if my friend had been at that strange meeting at the Hall of Celebrations I attended a month before leaving the country. Maybe he wasn’t there. But he was a journalist like me and that meeting was obligatory for all journalists in Baghdad. I don’t recall seeing him. But how would I have seen him? How would I see anybody? We were all turned into sheep with exactly the same horns. How should I be able to recognize any of us? There was no way to tell who had thrown trash at the editors onstage. No way to know who hit them with the butts of their guns. No way to know who shouted out the word “traitors.” No way to know whose blood was all over the stage. It was the same stage where Shakespeare’s plays had been performed by actors who killed one another in the same way, but the difference was that at the end of the play the actors would hold each other’s hands and take their bow for us, as we the audience would applaud for them. The curtain would be lowered in front of them, but we would know they were still there, and that their disappearance wasn’t forever. These days, people are leaving the homeland without suitcases. I was lucky because I left with one. My suitcase was my time capsule: I filled it with handwritten letters, poems (including some that were unsuitable for publication), drafts of novels by my friend Lutfiya al-Dulaimi (she was about to throw them in the trash), a silver flower that was a gift from a friend in Tunis (he said its fragrance is eternal), another dried flower inside my copy of The Little Prince. I left behind hundreds of books with a relative who said he would store them in his warehouse until I came back. Two years later, when I arrived in Detroit, he called me to apologize because he had to tear up the books in order to wrap the sandwiches at his restaurant on al-Rasheed Street. The sanctions on Iraq made everything smaller: papers and bread and hopes. I don’t think he would’ve been able to use the little poetry book by my friend Abdul Ameer Jaras — that book was smaller than any sandwich. It was as small as a book of matches. Because I had to leave in a hurry, I couldn’t find the book I wanted to take with me. It was called The Elephants’ Graveyard, which was about the habits of elephants, the way they live and die. It used to be my favorite book. When a group of elephants faces danger (usually when humans are hunting them for their ivory), the rest of the elephants will leave the area in protest. The elephants that live together also die together, so they go to the graveyard together and lie down there quietly, as if they had just finished some long and exhausting work. 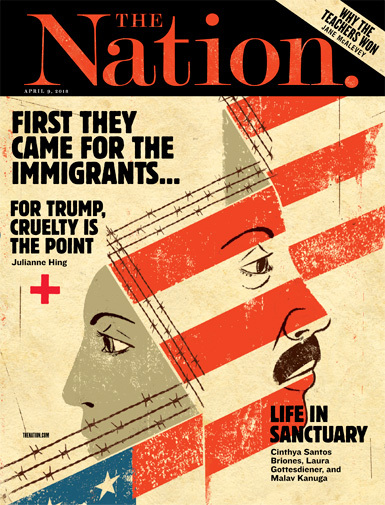 We weren’t elephants, so we didn’t do any such thing when “the others” left the country. Every time they leave, and we stay. This essay is adapted from the author’s The Beekeeper: Rescuing the Stolen Women of Iraq (translated by Max Weiss), to be published this month by New Directions. Dunya MikhailDunya Mikhail is a poet and journalist from Iraq. She currently lives in Michigan and works as an Arabic instructor for Michigan State University.